Marketing a brand is not an easy task but there are ways to make it more successful and a brand can use key influencers to help develop a strong marketing campaign. 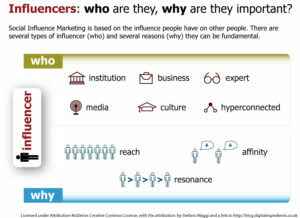 Influencer marketing is generally concerned with people above all. As a strategy it involves a brand identifying relevant individuals, often ones that are influential, in order to execute a highly targeted marketing campaign. These influencers are active online and followed by a brand’s target audience. They’re individuals who are passionate about the industry a brands business resides within. Initially when brands attempted to take advantage of the power of influencer marketing they did so with casual and subtle efforts that often involved perks or complimentary products. These brands often tried to keep those efforts under the radar and traditional blogger outreach programs are a good example of this. Brands would provide product samples to bloggers in exchange for a blog post or two. This model however has changed hugely and large blogger communities like Triberr, Sverve, and TapInfluence, have evolved into clear marketplaces where influencers and brands can collaborate to develop content. These marketplaces work a bit like a social media site and they allow influencers to post their work, audiences, and pricing in turn allowing brands to select the profiles that best match their needs. Although influencer marketing is becoming more prevalent and despite its evolution from traditional blogger platforms, it’s still an emerging advertising channel. Brands are beginning to recognise its full potential but it’s still relatively new and niche. Many brands currently use it for micro-campaigns, however it’s likely that influencer marketing will develop into a core digital channel for content creation and distribution. It seems important then for brands to embrace and utilise the influencer marketing model. Firstly it’s worth considering in more detail why this strategy can be beneficial. Traditional marketing techniques such as adverts, billboards, and even TV spots clearly have benefits; however, the marketing world (or perhaps audience) is changing. The more practiced marketing campaigns have in many ways run their course and that’s where influencer marketing comes in. As a strategy, influencer marketing is markedly different. Rather than the scattergun approach of traditional advertising avenues, influencer marketing is more personal. It could be considered as going around a party and talking to the most popular guests in a careful, considered, and tailored manner. Talking and spreading the word from person to person is highly beneficial to a brand’s marketing message. As it’s bespoke it’s much more likely to be noticed, for it to be relevant, and more likely to be passed on to others, greatly increasing reach and authenticity. How do you find key influencers for your business? In the past it would have been done more in person through events and other offline approaches – business networking events, for example. Now, with the advent of the internet, and more importantly social media websites, finding influencers is much easier. Put simply, a brand needs to find people who are active online and may be willing to share content with their followers. It may be worth considering looking for journalists or bloggers that write within the correct business niche. The important thing to remember is that brands are looking for people with respected opinions. Influencers must be a trusted authority in their field that can add content and value to a brand. Depending on the brand and its message, the type of influencer needed will vary. Some brands may be looking for relatively minor influencers that hold sway in a niche sector and others will be trying to find influencers with the widest reach possible, regardless of special interest. 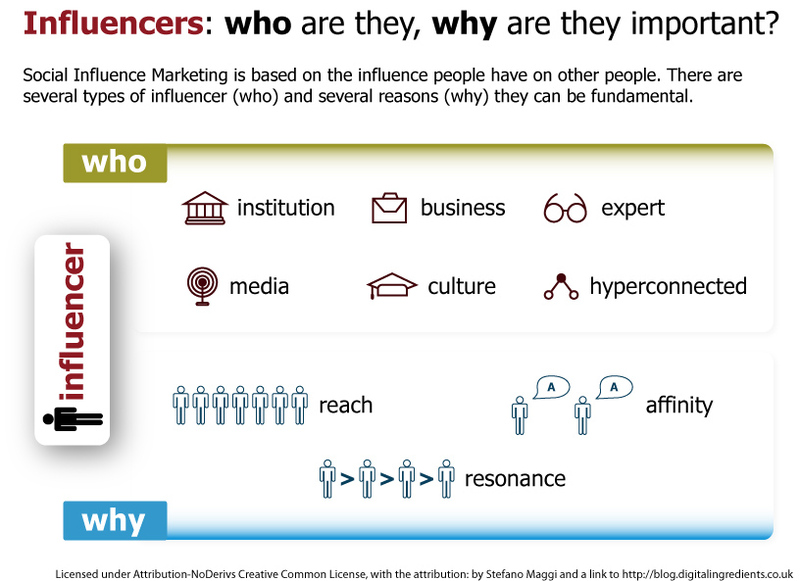 There is a helpful infographic that provides a breakdown of the different types of influencers. There are specific metrics that a brand can consider for each platform and its users. Selecting which ones and how to apply them will vary depending on the objective. Traacker is a paid service that will provide indepth analytics and draw out the crucial influencers for you. However if a brand does not have a budget for this there are a few free tool and tactics available. Followerwonk is a tool that allows a brand to “Search Twitter bios” which lets the brand type in key words and it will list Twitter users with those phrases in their bio. The list is ranked by the number of followers and social authority and it also provides some interesting stats about the number of tweets, how many followers a user has, and how many days old the account is. Brands should focus on individuals with the highest social authority. Klout is a resource for discovering influencers with a simple search. Users simply need to type in the key words of their choice and a list of influencers will be generated. Picking the right key words can take some trial and error. Klout also provides a scoring system – the higher the number the more influential they are. This isn’t a perfect metric but it’s helpful for getting a rough idea. Alltop is essentially a blog search engine that covers a variety of industries. Brands can search for a keyword or look at the Hot Topics. Be aware that Alltop will compile a mix of blogs and they differ in quality. Alternatively Technorati is another blog search engine that can provide a brand with good leads. The next step, once the correct influencers have been identified, is approaching them. How to approach them again is entirely contingent on the purpose for the brand. A good plan in general would be to tailor the message specifically to the influencer in question. An important part of any successful influencer campaign is the personal nature of the communication. Flattering influencers and truly valuing their engagement with a brand’s campaign strategy helps to get real momentum behind it, however it’s worth remembering that most influencers will see through generic, sales-driven approaches. In terms of rewarding an influencer for their contribution to a marketing campaign it’s important to consider the incentives on offer. Whilst money can be a useful incentive for influencer participation it does detract from the authenticity of interaction. The challenge then for marketers is to create a campaign that makes influencers desire to participate and be included. It works best if brands create an environment where influencers feel as though their involvement is mutually beneficial. Perhaps a brand can offer an influencer early access to an unreleased product providing both the brand and the influencer with an advantage. Influencer marketing strategies, when done well can be great fun and stimulating for influencers, but it also provides a brand with the opportunity to forge genuine links with customers. A brand inviting influencers, favoured members of online communities, to see how a business operates, showing off new products and other marketing accommodating exercises allows for a form of symbiosis. Brands and influencers can form strong bonds that can be used to help mould and amplify brand messaging and it can aid brands in conveying honest, instant, and informed feedback on its offerings. Influencer marketing is effective but it can only ever be as good as the concept and its execution. A banner advert, for example, can work effectively but only if it includes good copy, smart ideas and a valuable, convincing landing page to click through to. This same principle applies to influencer marketing. If the strategy that a brand employs intelligently considers the objectives, identifies effectively key influencers, and builds a strong marketing campaign this model can be incredibly successful.